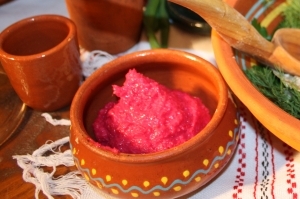 Horseradish | Шинок "Коса над Чаркою"
One of the oldest sides to meat courses. Mostly it was grated with beets, then salted, sweetened and dressed with beet kvass or diluted vinegar with water. So it could preserve more nutriments.